We recently had the very talented photographer Nicole Castonguay into our Minneapolis a&bé location to capture just a tiny bit of the magic that happens every single day. Our brides are more than guests, they are part of our shop, our family, the #aandbabes. As you enter the door you are greeted by one of our stylists, ready to get your appointment started! You may have coffees in hand or champagne in your purse (make sure it’s the clear kind ;) ) and the air is full of anticipation and excitement! You and your crew are led to your semi-private room where a big couch sits outside of the dressing room, in anticipation to see the first gown come out from behind it’s large curtain. You step into the first dress and your stylist helps you get all zipped and clipped to perfection! She swipes the curtain to the side to reveal the first gown to your friends and family. You step up on the pedestal and into the eyes of the large mirrors that bring the dream to life- you are getting married to your very best friend! This is all real! You’ve now tried on a few dresses and there seems to be that one wedding gown that has remained in the dressing room all this time… it’s time to put that gown back on…. 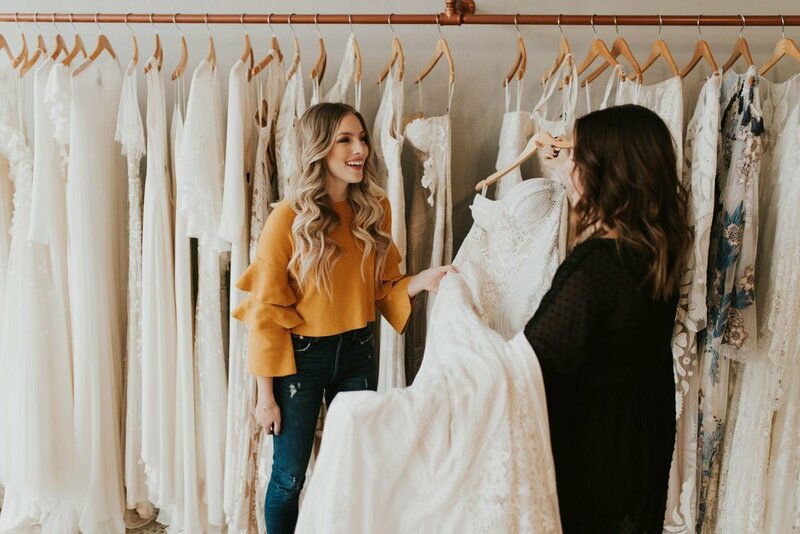 Each bride has her own ending when it comes to finding a dress and no matter what, we want you to feel comfortable and taken care of through the entire appointment. At a&bé, we are here to give you permission. Permission to be the bride you want to be. Want a full Hayley Paige ballgown with handkerchief trim? We got you. Looking for something with a deep “V”, fitted and lace? Okay! How about a romantic A-line with a unique back detail? We got you there too. We’d love for you to come visit the shop for yourself to get the full a&bé experience. We also have several upcoming trunk shows and specials events to make your visit even more special. Call or go online today to book your bridal appointment.